We always wanted to visit the home of Ferrari in Maranello so Tc pre-booked a Ferrari experience online with Motorsport prior to our visit to Italy. We asked our receptionist at our hotel in Florence what the best way to Maranello and she gladly gave us directions however little did we know that this would turn out to be an unexpected adventure. After all the train switches, we arrived in Maranello but we needed to take a taxi or bus to the Motorsport for the test drive Ferrari experience. The people in this small town hardly speak English so the little French we knew assisted with getting around and getting directions to where we needed to go. Did you know, Maranello is also the home of Giorgio Armani? All the magnificent threads from the iconic brand are made in the small town. 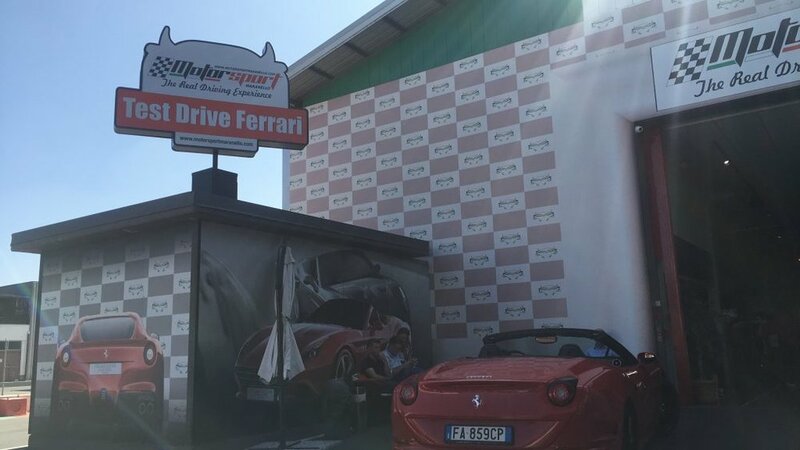 After 2 hours of travel from Florence, we finally arrived at the Ferrari experience, checked in and everything was good to go until Tc was asked for his driver’s licence that he, probably out of excitement, dropped when he got into the driver’s seat. Luckily one of the staff looked under the car and found it! Please be advised an International Driver’s permit is required when driving abroad, you can apply for one at your nearest AA centre, Tc went to the one at Centurion Lifestyle Centre but there is one at Menlyn Mall too. You are also required to provide your own country’s driver’s license along with the permit should you be pulled over as it just translates your home country licence. The Ferrari experience is amazing, I joined Tc for a half an hour drive around the same streets Enzo Ferarri got to test his automobile innovations many years ago. The First Ferrari we got to test drive was the California because it had rear seats, I would advise that a Ferrari is not really for back passengers and if you a really tall you will not have any leg room in the back should you opt for a shared experience. The second Ferrari Tc got to test drive was the iconic 458. On your experience you will get to drive past beautiful vineyards, zooming by other cars also requires some skill because the streets are very narrow, this made for fun memories as Tc had to be very observant of passing cars and trucks. The Ferrari museum is also in the same road as the test driving companies so on your visit there can learn about the history of Ferrari and view the oldest to the most recent Ferrari’s on display. Meletso spent our fair share of travel on trains in Italy, for the most part the trains are reliable. All our train trips were booked with our travel agent prior to our trip, except for our visit to Maranello. We decided to not make use of tour group and get ourselves to Maranello so that helped because we learnt that buying train tickets on the day is much more expensive and a lot like airplane tickets with all the expensive tickets left for late buyers. The closer to the time of departure the more expensive the ticket. An interesting fact is that Italy has multiple train service providers and prices are not fixed with allows for competition and choice. We purchased the last ticket back to Florence and little did we know we would have to wait an hour for our train because of a fire incident on the tracks. The trains can also change platforms literally at the last minute, Tc and I were waiting on the opposite platform when our train arrived so luckily he recognised the name of the train and we had to sprint and jump onto our train otherwise we would have missed our train. We eventually got back to Florence at about 21:00 that evening after our mini “Amazing Race” adventure. Do you have an interesting story of traveling abroad, have you ever missed a train or bus?